The London Gardener is a professional garden design & soft landscaping practice based in South West London, passionate about creating beautiful gardens and outdoor spaces to the highest standards. 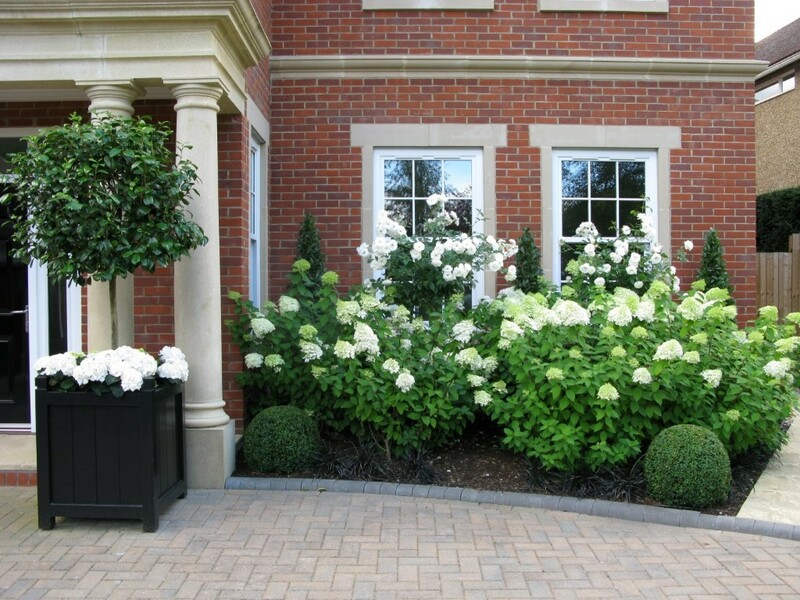 Large Drive and front garden designed with strong topiary shapes and a mix of long flowering Roses and Hydrangeas. 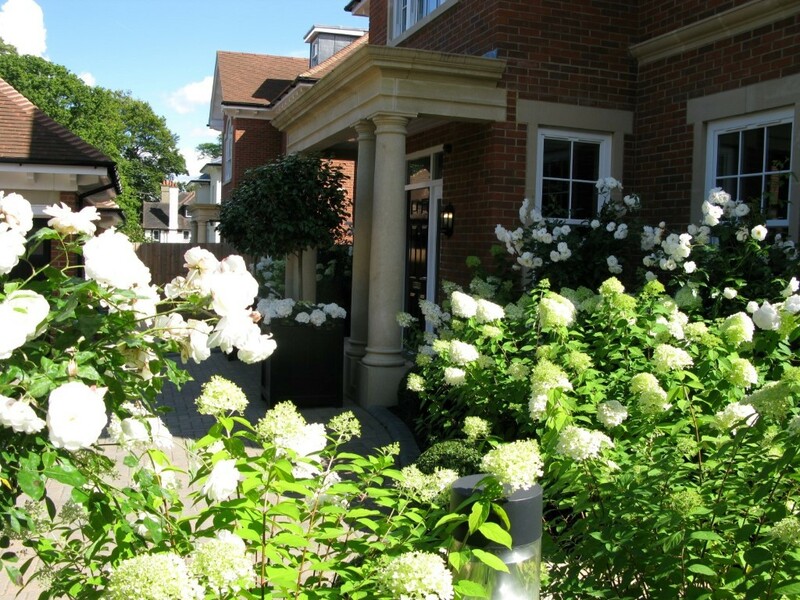 Our client wanted a stunning front garden, using only white flowers and topiary in a classic style. This was a high specification new-build house, so extensive preparation was needed to remove left over rubble and break up the heavy clay and chalk soil in the borders. This we did and added fresh topsoil along with a large quantity of organic compost. 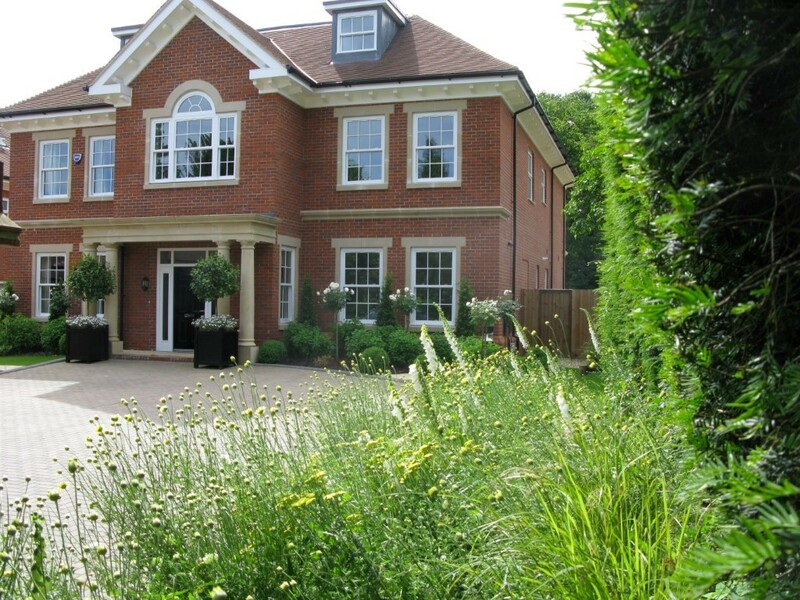 With a north-facing aspect, we designed a scheme using plants that would thrive in low light levels and still provide a long season of flower. A backdrop of topiary with evergreen Box balls and clipped Laurus Nobilis (Bay) cones, added year-round structure to the garden. The borders were edged with black grass and interplanted with clumps of spring flowering bulbs. 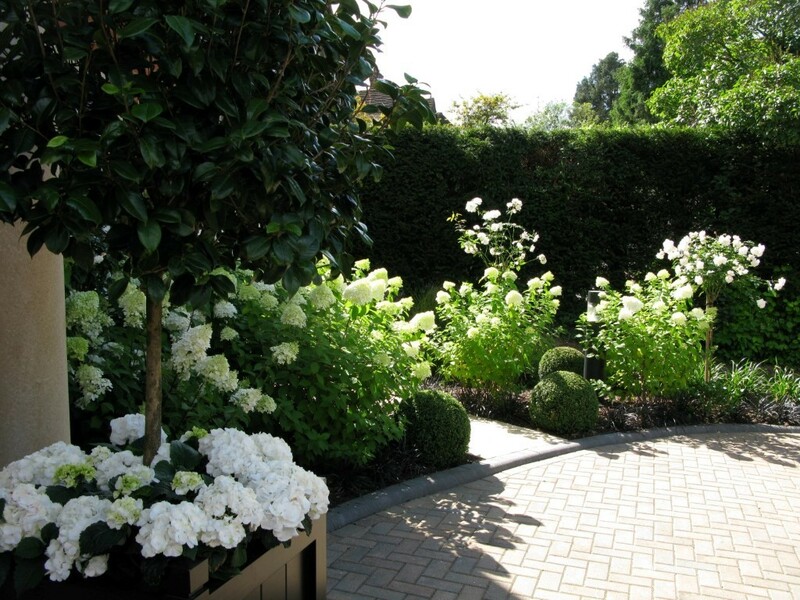 To give additional interest throughout the summer, we used white Iceberg standard Roses, interspersed with Alliums and Tulips, and for summer/autumn interest we planted Hydrangeas. 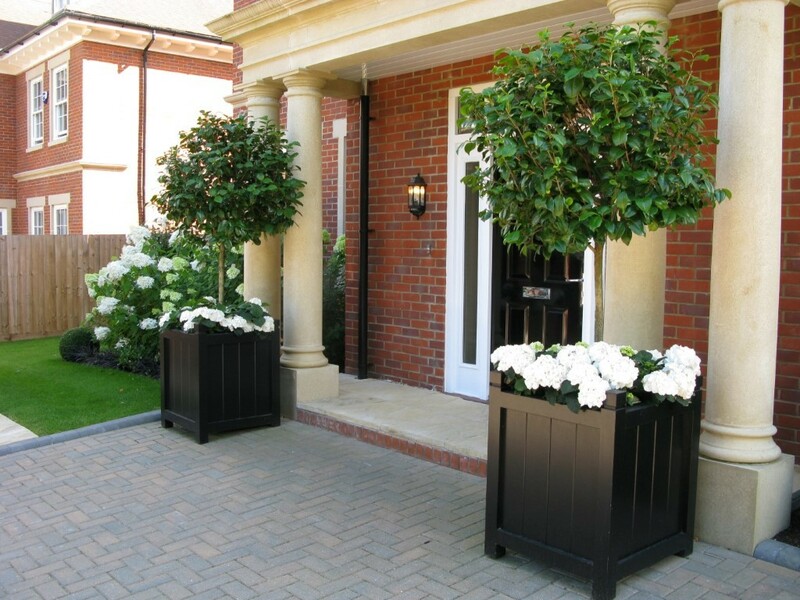 The entrance was given a greater degree of stature with two large bespoke planters containing Camellia standards and seasonal flowering plants. 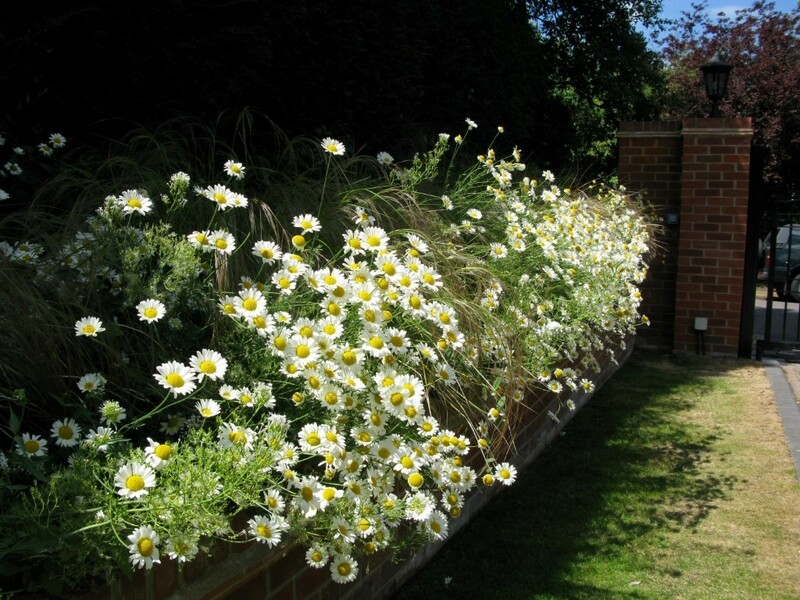 A sloping bank in front of a mature hedge was planted in a more contemporary style using a mix of evergreen grass and mainly white, robust, perennial flowers, including Foxgloves (Digitalis), Leucanthemum and Centranthus – all strong plants well suited to the poor soil. This created a meadow-like look which requires very little on-going work. The scheme was installed in early spring, when the soil was warm and took around three weeks to complete. 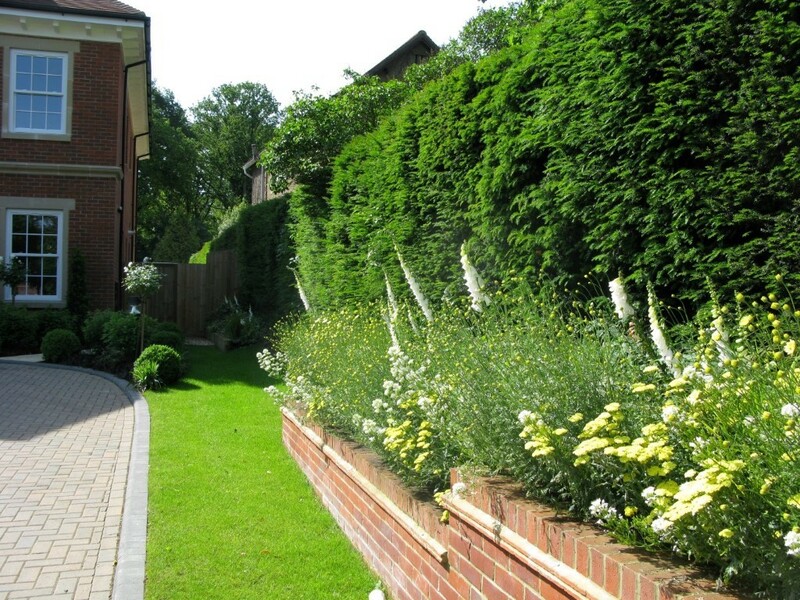 We subsequently designed and planted our clients’ rear garden and that of her neighbour.